Everything that you could want in a clematis - beautifully scented nodding flowers and year-round foliage. Clematis 'Winter Beauty' is a much-coveted clematis which grows up to 3m (12ft) tall, with dark, evergreen foliage that will make a stunning centrepiece for your garden. From mid-January, to the end of March, this climber bursts into life, with its clusters of delicately alluring, bell-shaped flowers releasing a delicate, sweet fragrance into the winter air. Robust and fully hardy, this clematis is highly ornamental over a long period when little else is in flower and is always in demand and quite rightly so. Popular and always in demand, make sure that you don't miss out on the limited stock! A really popular climber that tends to fly out of the nursery beds as soon as we release it for sale, 'Winter Beauty' is an evergreen clematis which grows up to 3m (12ft) tall, with dark, evergreen foliage that will make a stunning centrepiece for your garden. 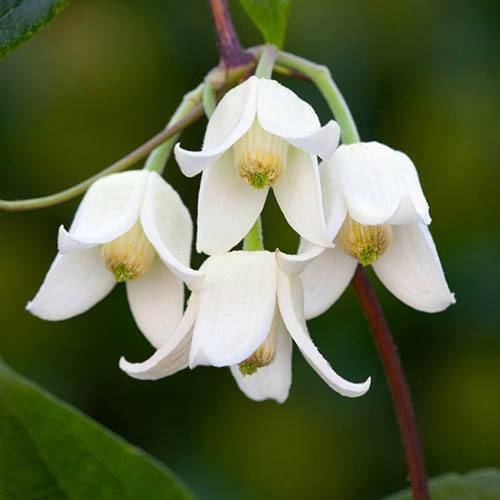 From mid-January, to the end of March, 'Winter Beauty' burst into life, its clusters of delicately alluring, bell-shaped flowers releasing a delicate, sweet fragrance into the winter air. A superb feature plant that flowers through the winter, Winter Beauty is also remarkable for its evergreen leaves which, unusually for an evergreen clematis, look like ordinary clematis leaves - providing year-round interest in your garden. Robust and fully hardy, this clematis is highly ornamental over a long period when little else is in flower and is always in demand and quite rightly so - plant it in free-draining soil by doorways or alongside pergolas to make the most of its pristine, waxy urns of bloom and evocative fragrance. Supplied as an established plant in a 9cm pot, it's popular and always in demand, so make sure that you don't miss out on the limited stock. Supplied as an established plantin a 9cm pot, reaching approximately 3m (12ft) when mature. Plant in free-draining soil. Winter Beauty likes a cool ‘root run’ so try and plant so that the roots are shaded. If you are planting in a sunny position, place some pieces of slate or flat stones on the soil after planting or use groundcover plants to keep the roots cool. Will appreciate a sheltered site with some winter protection such as a dry winter mulch. Pruning is a case of a simple tidy up - in late winter/early spring simply reduce all stems down to 15cm (6in) of soil level. However, please check the detailed advice on each variety as some differ slightly.